Hi everyone. Isn’t it interesting where life takes us sometimes. Thanks to the support and kindness of family, I find myself on a weekend away in the city. This is very different from my usual Saturdays which are very boring, I generally stay in bed all day resting from the week at work. Today we went for a walk around Darling Harbour, went to lunch and visited the markets. 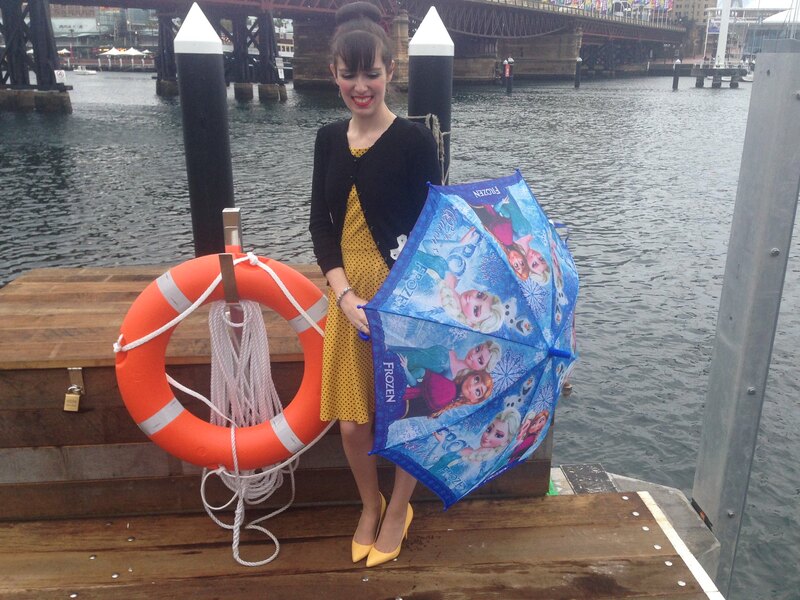 At the markets I bought this amazing ‘Frozen’ umbrella. Surprisingly I like Frozen, especially Princess Elsa because she is very pretty and I can relate to her a lot. Frozen merchandise is just about everywhere at the moment and I’ve wanted something for ages. What better than an umbrella, I cant wait to take it to work. The weather isn’t great at the moment as it’s rained for most of this month but with my panda umbrella and now my Frozen umbrella I don’t actually mind. 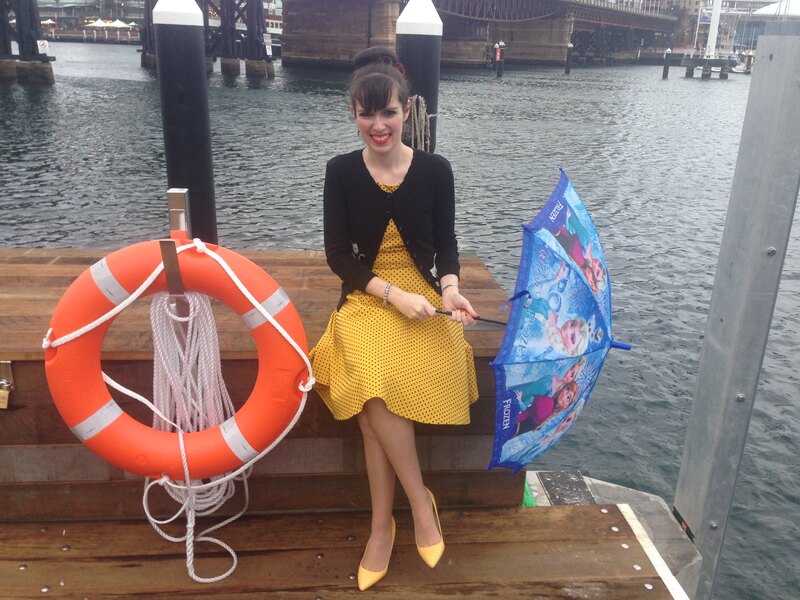 Darling Harbour is an excellent location for photos but the rain has made it very difficult. We walked around for ages just to get these few but any chance I have to do something different is great. In terms of my outfit this is a new dress I bought from Review. I more than ever need to cut back my spending but I’m using the end of college as an excuse to buy it at the moment. 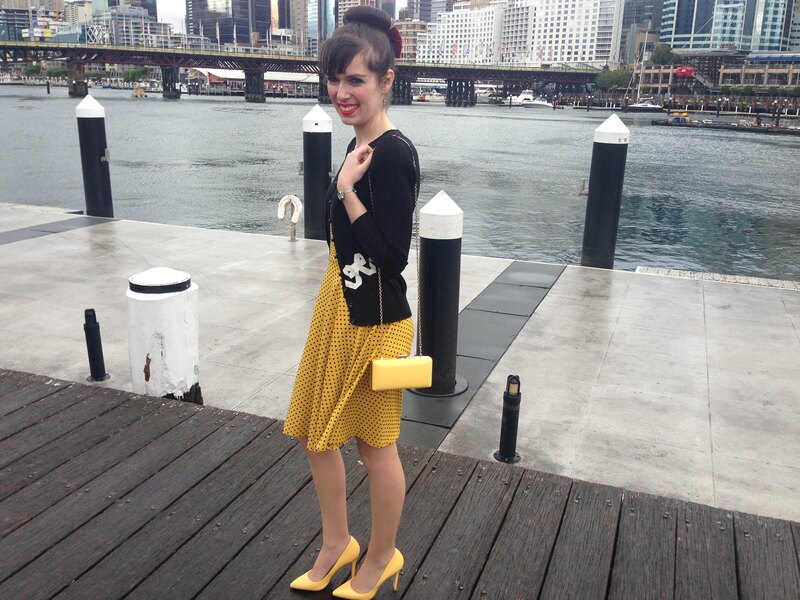 My new found love for yellow, combined with my long term love for polka dots makes this dress perfect. I also like how it’s a darker shade of yellow; I’ve liked mustard yellow for awhile now having seen in on so many blogs but don’t like it too dark so this is the ideal colour. I thought of my friend Mary from work when I bought this dress; it turns out she was the first to compliment my outfit when I wore it to work on Friday. I hope she buys the same dress and we can be matching! This week I’ve been feeling much more positive about life. It all started when I returned to work on Tuesday having been away at college for the week. The time away made me realise just how much I love the place I work, how grateful I am for the opportunity given the competitive job market for university graduates, and how I surprise myself each day with my capabilities. My job certainly isn’t hard but I’ve had such low self confidence for my whole life that I still never expected I could do anything like this. It makes me very emotional sometimes when I think about how much I’ve exceeded any expectation I ever had for myself. After almost a year at my current job, going to work each day is still having this impact on me. I know it won’t feel so positive forever, it comes and goes, but I’ll try to enjoy it while I can. Also, the reality is starting to set in that I’ve actually finished college of law and its only the release of results and an admission ceremony needed for me to officially be a lawyer. I’ve basically done it. There is no better feeling in the whole world than achieving something beyond all your expectations. This entry was posted in Florsheim, Lifestyle, Outfits, Review Australia. Bookmark the permalink. Those shoes are amazing! I love them and how it matches your dress! So wonderful! Congratulations on your graduations from Law school. You are truly an inspiration. I love your fun and chic sense of style. Will be following you from now on through G+! 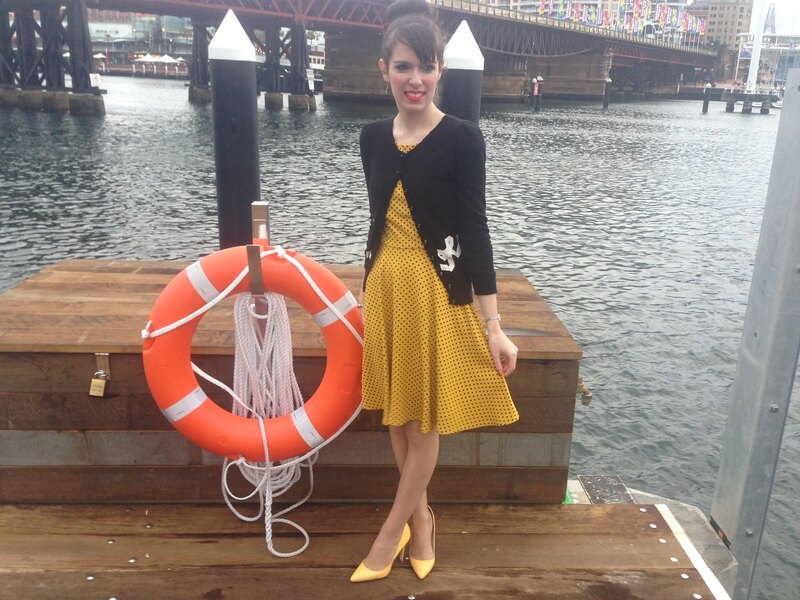 Love that yellow polka-dotted dress! So cute! Beautiful job! I just love this dress and you styled it perfectly with your heels. Such a flattering look on you! I love your sweater. Frozen was an adorable movie. Cute umbrella! Frozen is such a great movie! Your dress is adorable and the black cardigan is perfect with it! Gorgeous photos! You look adorable! This ensemble totally reminds me of a modern day Audrey! Chic! I just love how you style your dresses, you get it right every single time! No one can ever tell that you have had an issue with self confidence, because you dress very boldly a sure sign of confidence. It is good to be grateful always. Great post and such a lovely outfit to go with. Very nice colors and it looks great on you. Thanks for stopping by my blog. Love your outfit, it's perfect and your Frozen-umbrella!!! 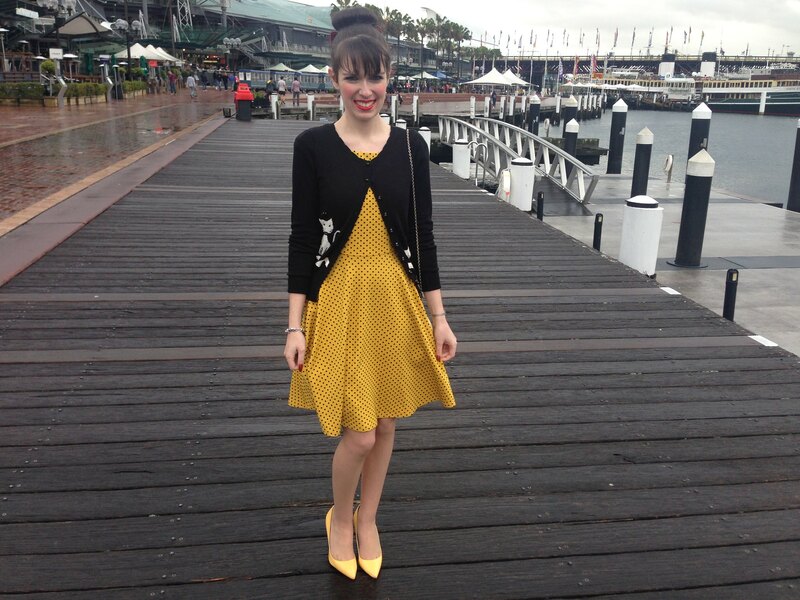 Love this yellow polka dot dress – looks amazing on you! You always look so flawless and perfectly chic! Love this outfit from head to toe! The yellow heels are really cute paired with the dress! Haha yes Frozen is everywhere here in Germany too, on backpacks, shoes etc. The other day my co-worker listened to the soundtrack while preparing the food for the café – and she's my age. Everyone is crazy about this movie 😉 I haven't seen it, I'm such an outsider. Congrats on being so close to accomplishing such a HUGE goal!! Love, love the polka dots!! Love the second photo! What a great place for photos! Wow, congratulation for your graduation! You did very well! That dress is gorgeous, it is the perfect length – I need some longer, but still cute, dresses since it is starting to get colder more often. I'm so pleased you are feeling more positive, you should definitely not question it and just enjoy it! What a perfect vintage vibe this outfit have! This is such a cute dress! I love yellow too, it's such a happy color :).